As a major electricity supplier, TransAlta relies heavily on its IT capabilities. Many IT systems are mission-critical – for example, their energy traders need a highly reliable platform so that electricity continues to flow to TransAlta’s customers. With more than 2,300 employees, TransAlta also needs to ensure that its business services and desktop infrastructure effectively supports its ongoing operations. 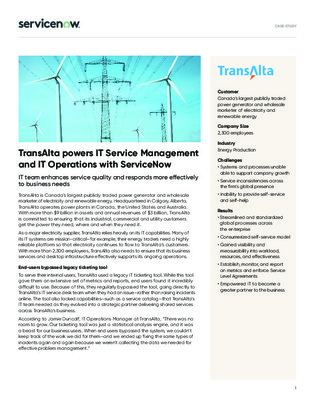 Download this eBook to learn how TransAlta powers IT Service management and IT Operations with ServiceNow.